Students of Color and allies marched from Foss to South College to read demands for the Univeristy to immediately address equity and inclusion on campus. 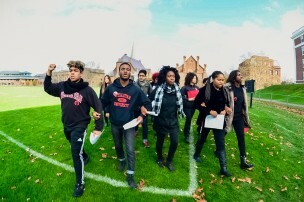 As part of a National Day of Solidarity on Wednesday, Nov. 18, students of color and allies marched in solidarity to present a list of demands to University President Michael Roth outside of his office at South College. On the event’s public Facebook page, few details were given regarding the proceedings of the event. Still, students, wearing all black, responded enthusiastically and organized into a five-line formation, each behind an appointed student leader. Outside of South College, the five appointed student leaders stood at the top of the building’s stairs as students formed an arc surrounding the smaller administrative building that houses Roth’s office. Students of color raised their fists in solidarity as Tedra James ’18, one of the five appointed student leaders, addressed the crowd first. “Thank you all for joining us today on this National Day of Solidarity with all colleges and universities throughout the United States and extending to South Africa,” James said. Then, Kenny Navedo ’18 continued by introducing the demands. This statement, along with the complete list of demands, can be found at isthiswhy.com, as can updates, information, and a list of student groups who have signed onto the statement. Student leaders read out the demands, as well as a list of student organizations that have signed on to the statement. At the time of publication, 85 student groups have signed onto the statement. The first demand is for equal and inclusive treatment. 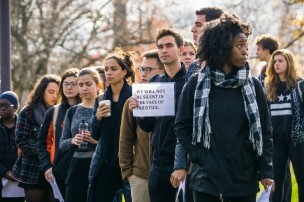 “We, members of the student of color community (SOC), demand to be holistically included as part of Wesleyan University’s student body, to have our demands heard on campus, and to be recognized and respected as individuals, not simply as numbers to fill the institution’s diversity quota,” the statement reads. The second demand is for a written statement of accountability to be produced within 48 hours, co-signed by President Roth and Vice President for Equity and Inclusion and Title IX Officer Antonio Farias, stating what the University will do to address the demands. Required in this statement is a declaration of past inaction in terms of equity and inclusion, as well as commitments to transparency and to the creation of a plan of action. The third demand is that University hire an Equity Advocate in the Office of Student Affairs, an individual appointed specifically to address the needs of marginalized populations on campus. The intent to launch the hiring process in the spring 2016 semester also must be made within 48 hours. Fourth, students seek the establishment of a multicultural center and the hiring of a Director of Multicultural Affairs. The statement acknowledges the existence of the Center for African American Studies and the University Organizing Center, but states that these resources do not serve as a viable substitute for an actual multicultural center. It also sets forth a timetable, that, if followed, would open the center by fall 2018. Finally, the students demand that the University commit to the monitoring of faculty bias and microaggressions through student reporting—a system which is to be devised by Nov. 30, 2015—and through the opportunity to identify potential sources of bias in end-of-semester evaluations beginning in the Spring 2016 semester. Following the reading of demands, students assembled for photos outside of Olin. The first photo featured all students who marched, and the second featured students of color specifically. The photos will be sent to other university student groups fighting injustices on their campuses in a display of solidarity. In response to the declaration of demands, Roth issued a statement on his blog. Roth, who joined the procession as demands were read, reaffirmed his belief that his goals and those of students of color and allies do not differ greatly. “Although I realized the awkward dimensions of my presence at the march, I share the major goals of this group and decided to join in their call for justice and community,” Roth’s statement reads. He continued by stating the University’s intent to do better in realizing these goals. Shayna Beaumont ’19 addressed the importance of the movement’s having a continuing presence on campus as well as continuing support from the student body. Ashley Luthers ’19 echoed her sentiments. “In light of everything that’s been going on across the country, college campuses, universities, with race becoming so heavily prevalent, it’s important that we do this here at Wesleyan, because… we just need to be active, not sit and be passive,” she said. Later on Wednesday, upon request, the demonstration’s organizers released an official statement addressing their goals and plans for further action. Additional reporting by Natasha Nurjadin, Assistant News Editor. The irony of being talked down to by a bunch morons that can’t even name the first amendment. But then again what can I really expect from people that can’t even wipe their young adult $$$es without their parents help? Hey, as a non-gendered, uncolored PhD of Wesleyan’s Unicorn and Leprechaun’s Studies Program I am deeply offended by your comment, as I was born without an A$$! What better way to completely undermine and illegitimatize your struggle towards “empowerment” as a race/ethnic group/minority/etc than to demand that someone else “give” you this power, thereby showing that you aren’t capable of attaining it or maintaining it yourself. This entire movement is a joke. And it’s beginning to show, as it comes apart at every seam. I am wondering what these “white only resources and considerations” are? These students say they need more resources specifically for their demographic in order to make up for some race-based deficit but do not give us any examples or statements as to what these unfair investments and resources are… I am also baffled.